Pakistan is committing gross human rights violations in Balochistan and Sindh since its creation. Baloch and Sindhi nations are deprived of freedom of expression, political and social rights. Balochistan was forcefully occupied in 1948. Baloch are resisting this forced annexation. Thousands of political and human rights activists were abducted, killed and dumped by Pakistani forces and its proxies. A number of mass graves were found in Balochistan. Pakistan is involved in genocide, war crimes and crime against humanity in Balochistan and Sindh. 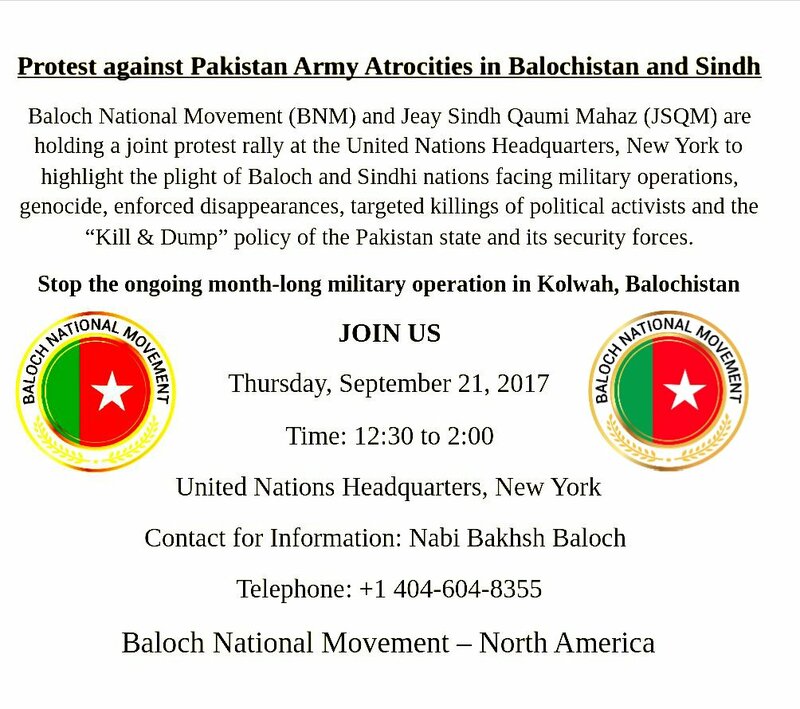 Baloch National Movement and Jiye Sindh Qaomi Mahaz will protest in front of UN office in New York, USA, the day when Pakistani Prime Minister Shahid Khaqan Abbasi will be addressing to the UN general assembly. We appeal to the world powers to impose sanctions on Pakistan for crimes such as nurturing religious extremists, training and exporting terrorists to the world, committing genocide, war crimes and crimes against humanity in Balochistan and Sindh.